(At least) two intersecting gravitational fields that vary periodically with equal (Figure A) or opposite (Figure B) phases create in their mutual intersection four new fields that are the subatomic particles of the central atomic nucleus. Following the Pauli exclusion principle, the subatomic particles of figure A will be fermions that obey the exclusion principle. Subatomic particles of figure B which do not follow the Pauli exclusion principle, will be bosons. – Beta minus decay occurs. – The positron (e+) field becomes a negative electron (e-) moving toward the left side. – The neutrino (v-) field transform into a negative neutron (n-), receiving the compression forces of the negative mesons (quarks) “a” top down and “e” bottom up, and the extra compression force of the positive quark “g” which moves from left to right (quarks “g” and “c” would correspond with the quarks currently known as “charm” and “strange”). – The previous positron (e+) field becomes inexistent, a virtual particle. – The positive proton (p+) field transforms into a positive antineutrino (v+), experiencing decompression forces from the negative quarks “d” top up and “b” bottom down. It suffers too an extra decompression from the positive quark “c” moving left to right. – The electron field becomes inexistent, a virtual particle. – The neutron (n-) field transforms into negative neutrino (v-), experiencing the decompression forces of the positive quarks “a” top up and “e” bottom down, and an extra decompression from the quark “g” moving right to left. – Beta plus decay occurs. – The electron field (e-) becomes a positive positron (e+) moving toward the right side. – The antineutrino field (v+) transforms into a positive proton (p+) experiencing the compression forces of the positive mesons (quarks) “e” top down and “b” bottom up. It receives an extra compression from the quark “c”. Note that when it comes to fermions, electron and positron are Majorana antiparticles that exist ad different times. Neutron – proton are Dirac antiparticles existing at different times. Neutrino-antineutrino are Dirac antiparticles too. I consider electrical charges are pushing forces created by the displacement of a field. I call negative to the left side and positive to the right. I call positive to the kinetic energy that increases although it can exist inside a field that is placed at the left side of a central axis of symmetry, and negative to the kinetic energy that decreases. In the cases of neutron and proton fields, their inner kinetic energies increase, they are positive energies, because of the reduction of the volume and the pushing forces that experiences the neutrino field when becoming neutron, or the antineutrino that becomes proton. In the case of neutrino and antineutrino they have decreasing kinetic energies that can be considered as Dirac negative energies. Electrons and positrons are formed by a top up quark and a top down quark (“a” and “d” in the pictures above). Mass and energy are not interchangeable. The conservation of mass and the conservations of energy are independent principles. The kinetic energy that the neutron field losses when becoming neutrino, is found in the increasing energy of the antineutrino field that transforms into proton. When the proton losses its energy becoming antineutrino, an inversely proportional energy is gained by the neutrino field that becomes neutron. The conservation of energy, when it comes to fermions, acts in antisymmetric planes. With respect to the conservation of mass, when the neutron field transforms into neutrino (A.2) its increasing volume suggests that it could be expected an inversely proportional decreasing of its mass density. At the same time, the field antineutrino transforms into proton decreasing its volume and increasing its density. But a loss of mass takes place when neutron transforms into neutrino (or proton into antineutrino), and a gain of mass takes place when the antineutrino becomes proton (or neutrino becomes neutron). The cause of the violation of the conservation of mass is produced by the action of the external quarks “g” and “c”. When neutron becomes neutrino the quark “g”, moving from right to left, adds and extra decompression on the neutrino field decreasing its density without respecting the proportionality with its increasing volume; At the same time, the quark “c”, moving from right to left, adds an extra compression force on the proton field increasing its density to a greater extent than it would be expected from its decreasing volume. But the conservation of mass is respected at mirror level, because the loss of mass that occurs in the neutron –> neutrino (or proton –> antineutrino) transformation has its proportional counterpart in the gain of mass that occurs in the Antineutrino –> Proton (or neutrino –> neutron) transformation. In momentum 1, the Photon (y) is the wave created by the periodical ascending pushing force of the subatomic field (proton P+) that exists in the central axis of symmetry, when the two intersecting gravitational fields contract at the same time. In momentum 2, when the two intersecting fields expand at the same time, a gamma decay takes place: the Proton field (p+) transforms into antineutrino (v+) experiencing a downward displacement that is interpreted like a loss of energy, although it has its counterpart at this time in the convex side of the intersecting gravitational fields, creating an antiphoton Y that is dark energy and creates antigravitational force. In momentum 1 the two subatomic fields that exist at the same time at the left and right sides of the central axis of symmetry are mirror reflected Dirac antiparticles that do no follow the Pauli exclusion principle. They have some similarities with the fermionic electron and positron fields but their energies act in a different plane, the vertical one. In momentum 2, they both experience an inversion and because of the displacement of the strange quarks, do not suffer the confinement created by the charm quarks ion momentum 1. It is because a change in their masses occurs because they do not receive now the same forces of pressure than before. In momentum 1 the top “a” and “d” quarks and the bottom “f” and “b” quarks are up. The two external quarks are charm. In momentum 2, the top “a” and “d” quarks and the bottom “f” and “b” quarks are down. The two external quarks transform into strange. With respect to the Higgs boson, considering that the Higgs boson is the vibration – the periodical variation – of the Higgs field, I think the atomic model that I explain here has some analogies with respect to the Higgs mechanism. 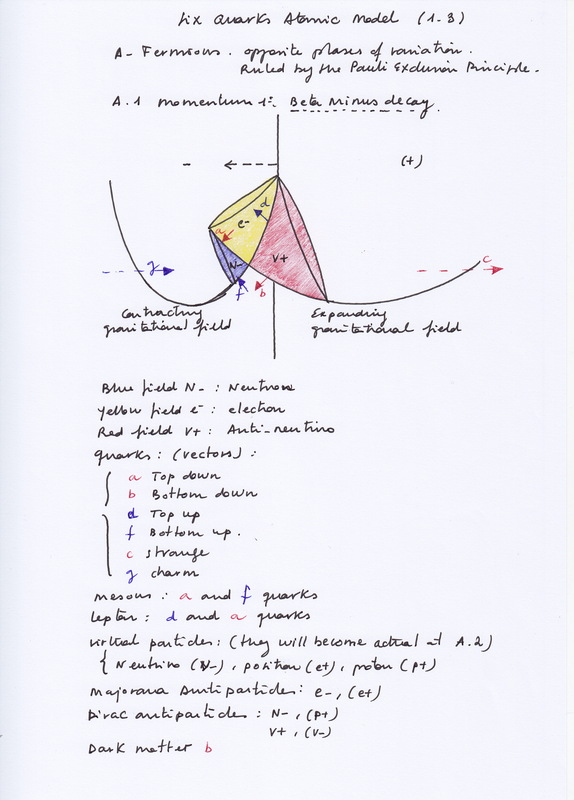 The periodical variation of the two intersecting fields would have a similar function that the Higgs boson. 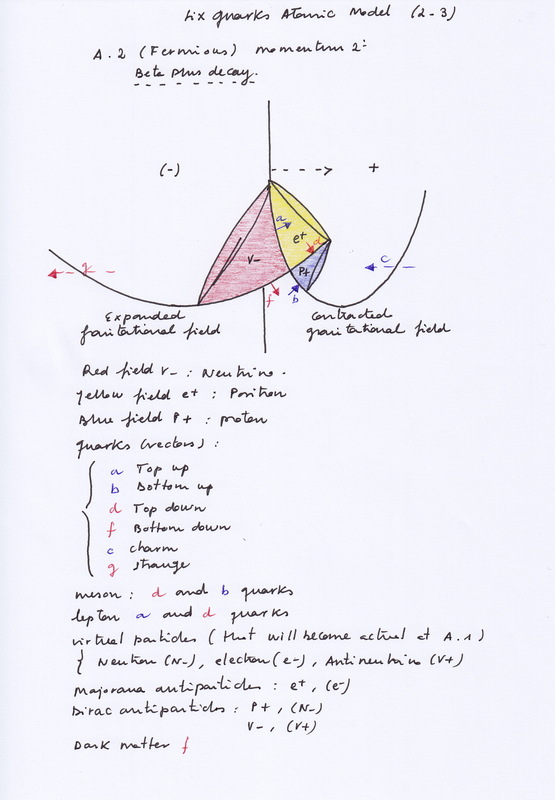 The mass and volume of all the subatomic fields in figure A and B are created by the periodical displacements of the intersecting fields that created them. Those pushing forces can be considered and explained as bosons or quarks, but they all are particular manifestations of the same mechanism. Although it is not represented on the pictures above, the central nucleus (and all the mechanism) experiences a progressive prelation turning on itself, on the central axis. 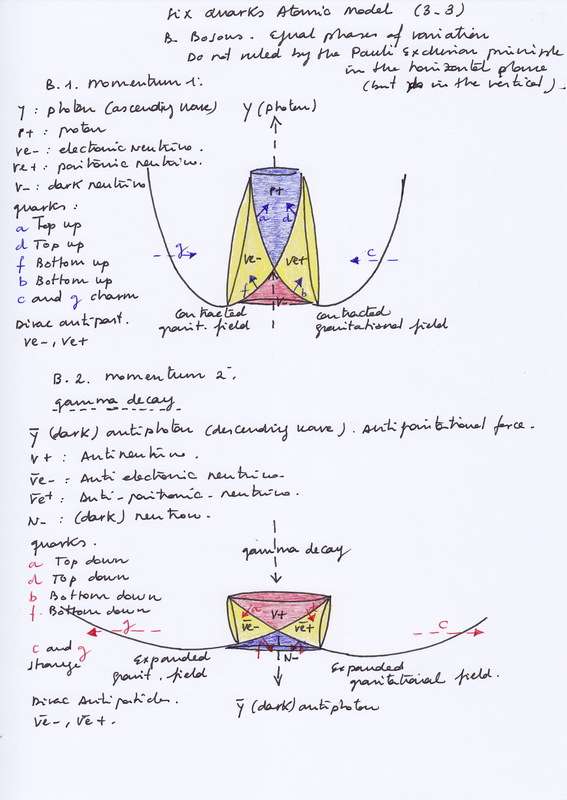 And the phases of variation of the intersecting fields would synchronize and desynchronize periodically. Fermions will become bosons and viceversa, periodically. Because of this progressive displacement on the horizontal plane there will be not a perfect spatial antisymmetry between electron and positron. When electron becomes positron, the positron field will not move toward the right side following the exact opposite path of the electron, it will follow a displaced path. And in this respect they can not be considered as antiparticles. But after some time electron and positron will have inverted their positions: now the previous left electron is placed at the right side and the previous right positron is placed at the left side, a physical electromagnetic inversion has take placed. Now, properly, the previous electron is a current positron, it is its own Majorana antiparticle, and the previous positron is a current electron, its own antiparticle too. But considered in this way, the same could be said with respect to neutron and proton. 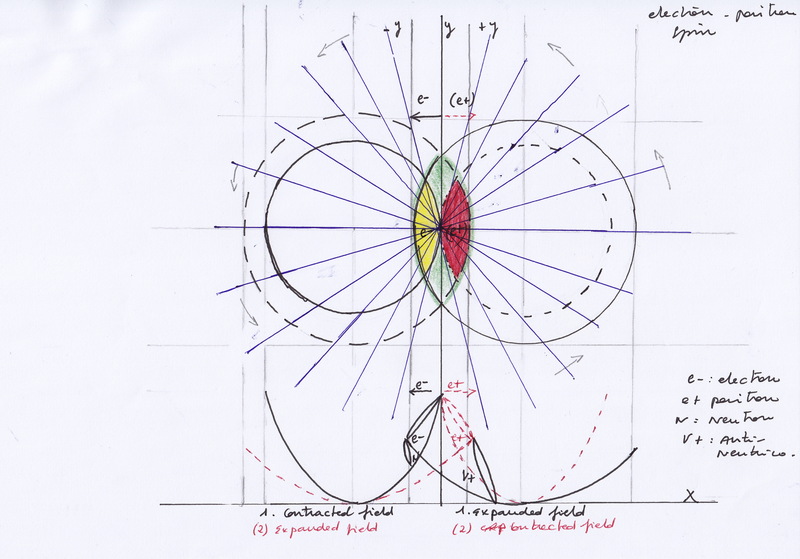 On the picture above I have represented two fields that vary with opposite phase; on the top view, colored in yellow is the electron field moving toward the left side. At this time the red positron field is a virtual particle which does not exist. But all the central figure and the whole system turns on it self, this movement is represented on the top view by the blue lines, its center is the center of symmetry of the system. I think this circular or spiral displacement caused by the mentioned prelation would correspond with the currently known as “spin” of the electron and positron. But all the subatomic particles would have this kind of circular spin. 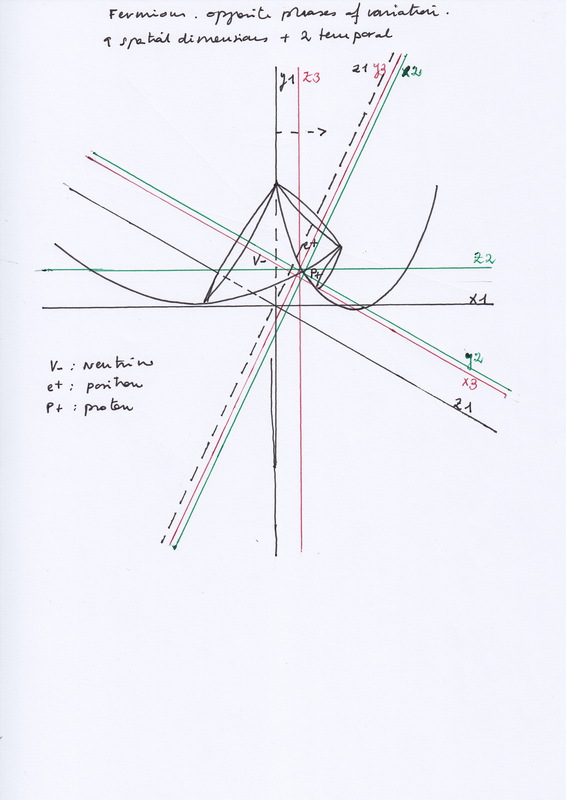 In the case of the photon created by two intersecting fields when they both contract at the same time, the photon is the force created by the upward movement and the waves that it produces, , it is not the field itself. And this photon has always its origin in the middle of the central symmetry, independently of the spin of the ascending-descending field. I am speculating here with different possibilities. But anyway, I consider that the inner kinetic (magnetic) energy, the orbital motion that exists inside of each subatomic particle-field is not produced because of the particle turns on itself. The subatomic particle does not turn on it self. Their inner orbital motions of each subparticle are caused by the periodical pressures that they experience, acting as pushing forces on them. With respect of the fine structure, I think when it comes to the photon, when the two intersecting fields vary with equal phases and contract at the same time, it has its counterpart in a gross structure when the gamma energy occurs because the intersecting fields expand; this gross structure takes place at the convex side of the intersecting fields. With respect to dark matter and dark energy. What we consider “dark” depends on the perspective that we are observing. 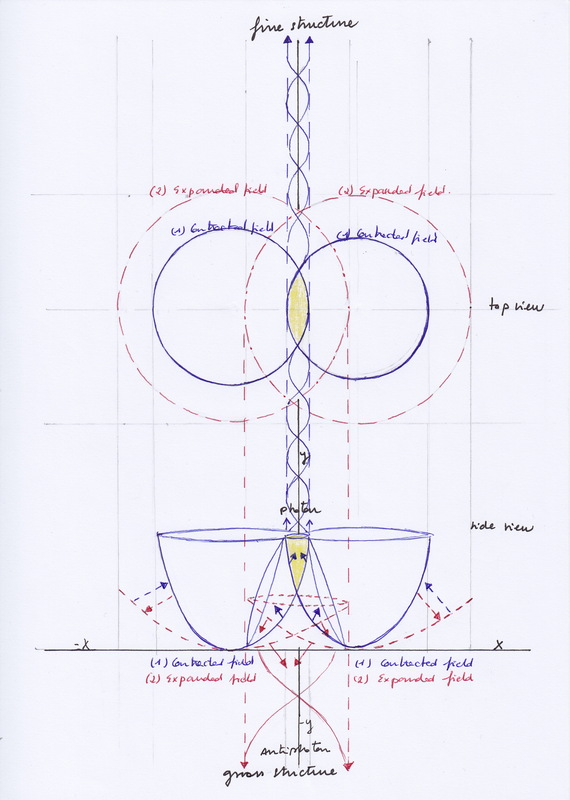 If we are watching from the concave side of the mechanism when the two intersecting field contract at the same time, we will perceive the wave caused by the ascending field and we will call it “photon”. But later, when those two intersecting fields expand at the same time and the ascending field moves downward, decreasing its energy, we will not perceive the effects that will take place at the convex side of the intersecting field. They will be consider dark for us. The same could be said when it comes to fermions and we are placed at the left side of the mechanism, inside of the left intersecting field, we will perceive the effects of the electron field moving toward the left side but do not the effects of the positron. And so on. With respect to the implied dimensions, in the case of fermions there are 9 non commutative spatial dimensions and two temporal; when it comes to bosons, there will be 1 unique temporal dimension (Although because the phases of variation synchronize and desynchronize periodically, the two temporal dimensions will became one when fermions become bosons, and viceversa). On the other hand, I consider this model would be applicable at astrophysical level too: the two intersecting fields could represent the intersecting gravitational fields of two entangled stars, or they could be two intersecting parallel universes creating periodical Big bangs (when emitting a photon) and Big silences (when gamma decay occurs); It would explain too, with a unique mechanism, all the observed asymmetries and periodic fluctuations of our solar system. But it would make necessary to review the whole accepted solar system model. Between other things, the existence of an Anti-Earth with its gravitational field intersecting with the Earth’s gravitational field would be necessary. You can find more explanations about gravity as force of pressure and other questions like Van der Waals and Casimir forces, antimatter in the periodical table of elements, spectral lines, nuclear fission, antigravity, zero force points, etc, in other posts on this blog.